Monet Paintings all the main canvases of the master of Impressionism: poppy field near Argenteuil, Impression Sunrise, the Magpie, the Seine at Vetheuil, series of Rouen Cathedral, Haystack, Water Lilies and more. Claude Monet's garden in Giverny. Located 80 km West from Paris France in the village of Giverny, 4 km from the town of Vernon, Claude Monet House and Gardens are now open to visitors. This section describes the visit and presents photos of the water lily pond, Japanese bridge, Grande Allee, flower garden and more. 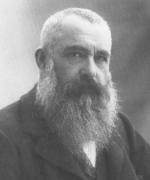 Monet biography : The Life of Claude Oscar Monet, from his birth in Paris in 1840 through his death in Giverny in 1926. 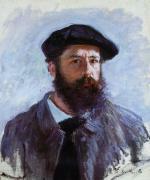 Claude Monet by himself: Discover the sense of humour of Monet when he recounted his memories to a journalist in 1900. His friends were called Renoir, Sisley, Courbet, Pissarro. Giverny France Claude Monet's village was also a colony of American painters at the turn of the 20th century. The village and its surroundings have been painted so often by so many impressionist artists that they now belong to the world of those who know it and love it. Claude Monet in Museums in the USA, Europe, Japan... Here are the original masterpieces. Exhibitions of Monet: There is always an exhibition of Monet's works somewhere in the world ! Monet in Venice, Italy A unique painting campaign with his wife to capture the light of the Grand Canal, San Giorgio Maggiore, the Doge Palace. Monet almost never left Europe, thus never traveled to Japan. But in his Giverny home, he surrounded himself with Japanese woodblock prints. Giverny News, a one-picture-a-day blog about Monet and Giverny area (in french). Monet art bookstore. Further readings on Monet and on his garden in Giverny.